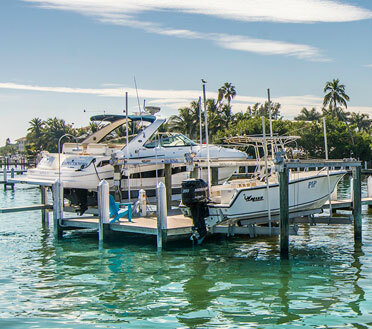 Boat lifts can transform the way you view your waterfront property. In fact they can allow you to appreciate your watercraft in a way you were unable to before installation! Immediate gratification. Want to take your ride out for a spin on the water? Just load up, step out back, and go. Less maintenance. With your vessel up and out of the water, you eliminate the problems of algae or barnacle growth and damage associated with hulls that sit in the water constantly. You can also remove the worry of tide fluctuations and waves causing damage to the hull as it collides with the dock or pilings. And with the option of an added boat house to completely shelter your vessel, you can protect the top of the vehicle from the Southwest Florida sun, wind, and rain while it’s not in use! A closer view of the Scout’s home with her award winning tarpon boat on a beautifully constructed boat lift. Old Florida Dock design with 20,000lbs. and 12,000lbs. Sea Drive Lifts Captiva, Florida. Another Old Florida Style dock with a roof to shade the Hinckley – Captiva, Florida. Spectacular Old Florida Island dock configuration. Personal Watercraft lifts situated on a unbridged Florida Island, Spectacular views!